The –no-site-packages is the default now, so we don’t include it here (you could, but it’s deprecated). This helps keep things sane. You should see that your shell prompt has changed, and now has “(applesauce-virtualenv)” at the front of the prompt. This lets you know that you have already “logged in” to your virtualenv. Then, make sure that you are in your virtual environment and install these python things using pip. Since we’re installing these packages into the virtualenv we don’t need to use sudo. Now, you can start working with Django. You might want to start with the official tutorial, Writing your first Django app. I work at a desk all day and enjoy listening to music while I work. I also occasionally play video games where it’s nice to have a microphone for the team chat. I don’t really like ear buds since they make my ears hurt, and the “on-ear” headphones that just press on your ears also hurt after a while. I never thought of myself as the “big headphones” guy, but on the suggestion of a friend I bought a pair of Koss SB49 headphones (not an affiliate link). They are the first pair of headphones I’ve tried that are actually comfortable enough to wear all day long. The cups are large enough to fit around my entire ear, so they only rest against my head, not pressing on my ears. The sound quality is most excellent (especially good bass response which is normally reduced on most headphones) and the microphone quality is top-notch too. Comes with a small volume adjust slider, and the cable has two plugs, one for the microphone and one for the speakers. It would be really nice to find an adapter cable to let me use this headphone+mic with a cellphone. Update! 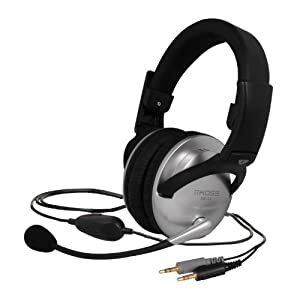 I’ve since found a great adapter cable to adapt these (and similar) computer headphones to use the TRRS plug needed by a cell phone’s external headset jack. This adapter is $16 on Amazon.com and has Prime shipping, and has worked very well for me on my MyTouch 4G Slide phone. When reviewing and editing papers, my advisor likes to use his copy of Adobe Acrobat to mark-up the insertions, deletions, and add comments to the original PDF. This works nicely, but when overlapping comments are present, such as a block comment over an entire paragraph with sentence-specific edits “underneath” the block comment, none of the “standard” PDF viewers on Linux (including the official Adobe Reader for Linux) are able to access the buried mark-up. Fortunately, I have discovered that a freeware program called PDF XChange Viewer can be easily run using WINE, and allows you to view, edit, and create PDF annotations. I haven’t tried creating or editing annotations, but I certainly do use it to delete block annotations covering up the more specific edits. Auto indent and auto syntax highlighting. I use a black background terminal, so the “set bg=dark” optimizes the colors for a dark background. I like 4 spaces for my indenting, no tabs. I use the F5 key to toggle search result highlighting, and F6 to toggle between paste mode (no auto-indent) and no-paste mode. Adjust the size of the images by changing the “640” above to whatever image width you like.